In some cases, it may be inadvertent, such as combining prescription meds with each other or taken with alcohol. It is imperative for the doctor to educate patients on their use. In addition, meticulous medication reconciliation must be performed when discharging patients from hospitals. The type of polysubstance abuse in focus here is where illicit, prescription or both are abused intentionally. 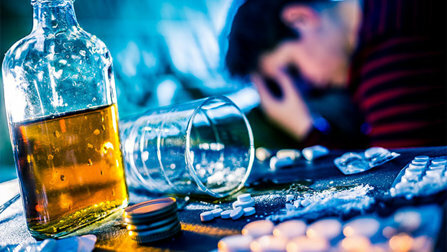 Users often have a preferred substance of abuse that they then combine with other substances at times to enhance the primary substance’s effects. Unfortunately, the combination of these drugs may enhance the negative effects of each drug as well. Furthermore, there may be unpredictable consequences. Worsened toxicity/side effects: When drugs are abused together, the potential severity of these side effects is increased significantly. There is an increased addictive effect as well. General side effects include nausea, vomiting, body pain, balance issues, and heart rate, respiration rate, and blood pressure changes. Reduced metabolism: Drug interactions can reduce metabolism, resulting in increasing their blood concentrations, which in turn causes a significantly increased effect of these drugs. Overdose: There is a greater risk of overdose when multiple substances are abused. This is because certain substances mask the effects of other substances, and users may not realize that are taking far higher doses in order to feel the full effects of one substance. Complicated treatment: Overdose from polysubstance abuse is more difficult to detect and especially to treat. The antidotes, such as naloxone may not remain as effective. These situations generally require more specialized treatment to achieve full recovery. Concurrent mental health issues: There is an increased likelihood of a history of mental disorder in these patients. These conditions make each other worse and more difficult to treat. As withdrawal from a polysubstance overdose can be unpredictable, inpatient medical detox is generally recommended. These patients are supervised round the clock by medical professionals. Their vitals is continually monitored and withdrawal symptoms are readily addressed. In some circumstances, such as opioid abuse, long-term treatment (at a methadone clinic) is required. In addition, counseling focusing on support and encouragement increases the chances of successful recovery. A suitable rehabilitation program will offer both psychological and physical treatment options. Treatment initiation: focuses on alleviating symptoms or physiological withdrawal. Maintaining abstinence: After about 3 months m of continuous abstinence, clients move on to maintaining abstinence. Patients will transition from residential programs to outpatient rehab. Complete abstinence: This takes place when the patient has achieved complete abstinence for five years.